1. Why do you have so many guitars, don’t you really need this many? Well no I don’t “need” all of them but I want them. I truly love these guitars so why not get them when I can… and I do play all of these guitars, and I’m not kidding! I walk in my room pick one and sit down with play some tunes or take them out to rehearsals and lessons, hey why not use them when I got them. 2. There’s got to be bunch of guitars that does not get played much, that’s a waste isn’t it? No, I actually play all of these guitars, again I’m not kidding!! Sure some of them get played more than others but they all get some share of being played. Yes this goes to some rare guitars that should be in a plastic case for a display but hey guitars are meant to be played not displayed, right? And Yes! I do play that brand spanking new expensive ones like Floral Jem or US customs with no scratches. Only thing they don’t get to do much is leave home. 3. Do you buy guitars everyday? 4. Why do you have same guitars in your collection? What’s the point? 5. Are these guitars all mint condition collectable guitars? 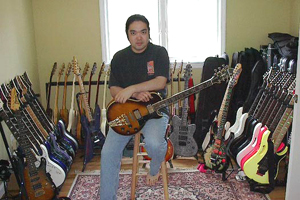 No, I’m a player collector so one guy told me, I buy most of the stuff used and I don’t mind the beat up guitars. Many of them may look great in the pics but some of them are really beat up, but so what I play them. 6. Have you ever forgot you owned one the guitar since you got so many? 7. What is your budget on string? Not that bad actually. Since I got many of them, as you can see, aging of strings on each guitar is rather slow; I do tend to play one with old strings more until I really kill it than I change them and than moving on to another. Does that make sense? 8. Are you an independently wealthy person? No I wouldn’t say that, I work very hard for living but I do spend enough on guitars… plus I guess being single helps? Hmmm… Well now I'm married but my wife is supportive on my guitar collection, infact she gave me few guitars already for my Birthday and for Xmas... lucky? Yes I have to say that! 9. Do you do your own set ups on these guitars? Yes I do, But I don’t do everything if there something that needs to get fixed that I can’t fix I have a great repair guy friend. 10. Why do you buy Ibanez guitars? And why would you buy those copies and not the real Gibson or Fender? First, I do own some Gibson and Fender. But I just like Ibanez guitars and may be hard to believe for some people but these copies from 70’s a great guitars. 11. Do you ever sell guitars? 12. You have some very nice Ibanez guitars but you also have some very crappy Ibanez as well, why? One, because it’s an Ibanez guitar I thought be nice to add to my collection even though the quality may not be same as Jems or other high end ones, but I must say surprisingly ones those guitars that people think “crappy” are some of my favorite guitars… remember cheap doesn’t mean bad. 13. You are missing some major must have Ibanez in your collection, why? 14. Are these guitars on the site for sale or for display? They are for display, but I do sell them time to time, than the pics move to “guitars I owned” page. 15. Do you consider yourself an expert on Ibanez guitars? Hmmm… not sure, probably not but I do know a lot about these guitars. I am still discovering some stuff and always learning something new about these guitars. I did my research in the past and I still do when I come across some cool looking Ibanez. You got one for me?